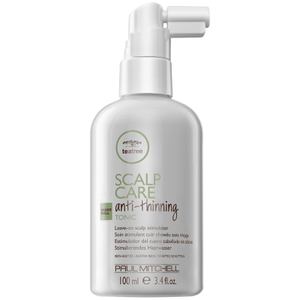 Encourage full-bodied locks with the Paul Mitchell Tea Tree Scalp Care Anti-Thinning Tonic; a potent solution that creates an optimal scalp environment for thick, strong and healthy hair. Created with Paul Mitchell’s exclusive Regeniplex® blend, which intelligently combines Kakaku Plum, Pea Peptides and Ginseng, the leave-on tonic is effortlessly absorbed by the scalp. 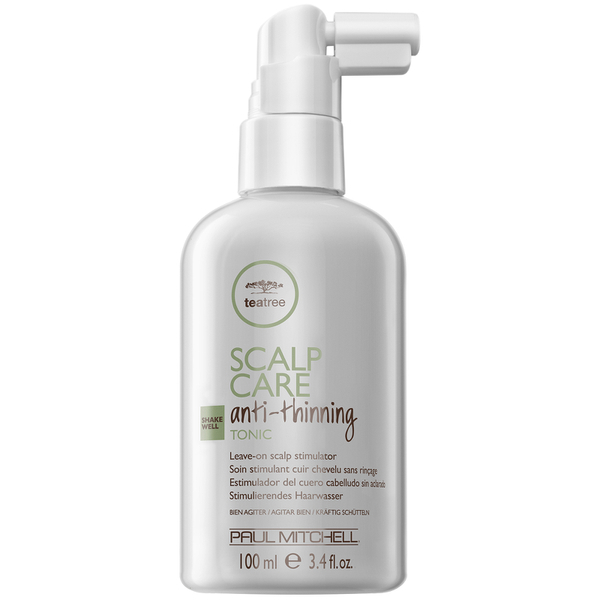 The tonic stimulates the scalp and helps to protect hair against breakages. Less breakage results in fuller locks that are visibly thick and healthy. With continued use, healthy hair growth is promoted and tresses appear denser and fuller. Aqua (Water, Eau), Alcohol Denat. (SD Alcohol 40-B) (SDA-CA-2877), Butylene Glycol, Ethoxydiglycol, Methyl Gluceth-20, Trifolium Pratense (Clover) Flower Extract, Terminalia Ferdinandiana (Kakadu Plum) Fruit Extract, Pisum Sativum (Pea) Peptide, Melaleuca Alternifolia (Tea Tree) Leaf Oil, Keratin, Hydrolyzed Keratin, Oxidized Keratin, Panthenol, Biotin, Niacin, Acetyl Tetrapeptide-3, Adenosine, Dioscorea Villosa (Wild Yam) Root Extract, Serenoa Serrulata (Saw Palmetto) Fruit Extract, Glycine Soja (Soybean) Seed Extract, Hydrolyzed Yeast Protein, Panax Ginseng (Ginseng) Root Extract, Saccharomyces Lysate Extract, Hydrolyzed Vegetable Protein PG-Propyl Silanetriol, Dextran, Glycerin, Alcohol, Polyquaternium-37, Potassium Sorbate, Sodium Benzoate, Phenoxyethanol, Parfum (Fragrance), Citral, Citronellol, Coumarin, Eugenol, Geraniol, Limonene, Linalool.